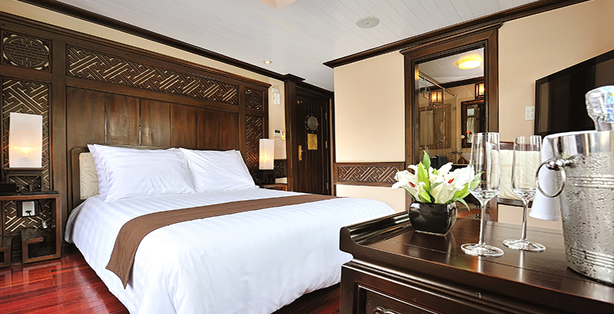 17 cabins of Paradise Cruise are divided into three classes Superior, Deluxe and Suites, all are of state-of-the art facility and service provided, with central air-conditioning, en-suite bathroom and private balconies and heavenly-soft bed with wide open view to Halong Bay. 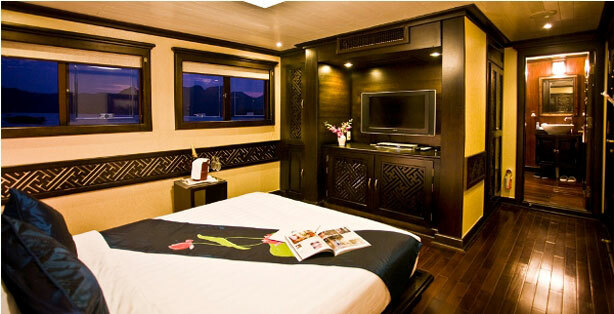 Passengers on Paradise Cruise may also experience a number of exciting on-board activities: Beauty Spa and Massage; free swimming, kayaking and snorkeling plus all the equipments one may need and interesting itinerary to explore the breathtaking beauty of Halong Bay. 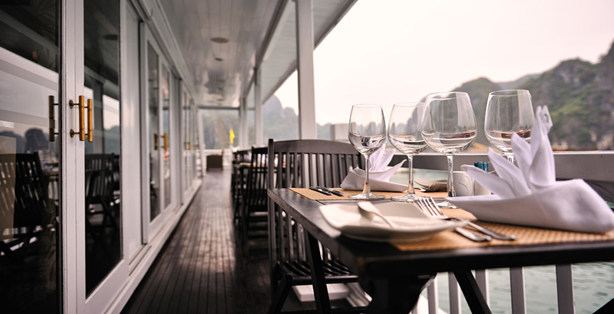 Serve Special Paradise Lunch on board while cruising passing by islets, Hoa Cuong fishing village. After lunch continues exploration of Halong Bay passing by Soi Sim Beach, Coconut Three Island. Anchoring the vessels at Dark and Bright Cave area. 14.45pm – 15.45pm Exploring Dark and Bright Cave by rowing bamboo boats with local people or kayaking by yourself. 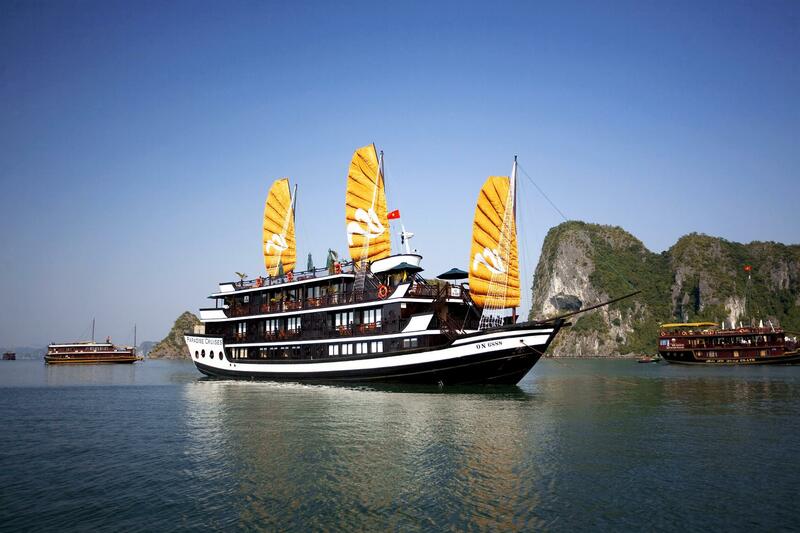 15.45pm – 16.15pm The Vessels will continuous cruising in Lan Ha Bay passing by Cua Van floating Village, Tien Ong Cave and anchoring the vessels in Ho Dong Tien. 16.15pm – 17:00pm Enjoy swimming and kayaking at Ho dong Tien area. 18.00pm – 18.30pm Enjoy cooking demonstration with Chef to discover the Vietnamese cuisine of traditional spring rolls. Learn how to toast Vietnamese way through the evening’s toast of the local rice wine. 18.30pm – 19.00pm Pre-dinner cocktail on sundeck serving assorted nuts and canapé. 19.30pm – 22.00pm Serve elegant Paradise dinner. 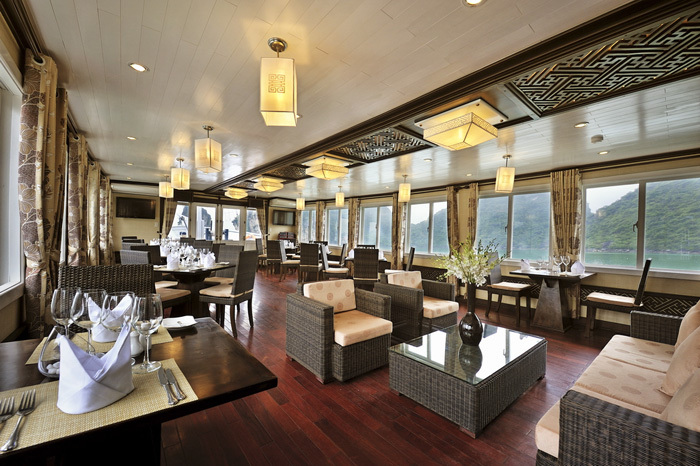 Start dinner in Traditional Bao Dai dress and photo shoot with captain and manager on board. 21.00pm – 23.00pm Evening Activities – relax at leisure; enjoy Movie Night and squid Fishing or Beauty Spa services. 6.30am Tai Chi session on Sundeck. 7.00am – 7.30am Coffee & tea with assorted homemade pastries. 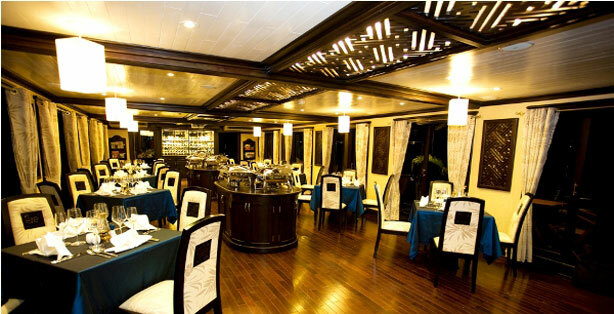 7.45am - 8.30am International Breakfast buffet served on board. 10.30am Exploring Bai Tu Long Bay and enjoy kayaking, swimming and exploring the cave in Thien Canh Son Beach. 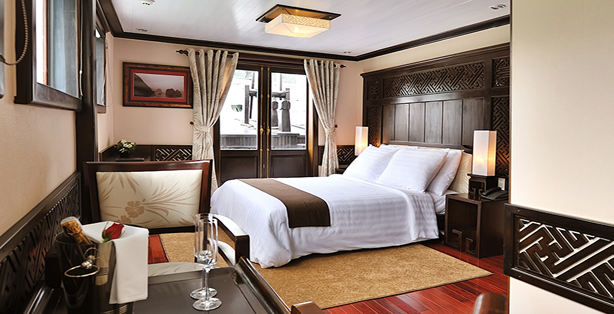 12.30pm Return to Paradise Explorer and Continue cruising to the Vung Vieng Floating Village. Vietnamese lunch served on-board. 14.00pm Arrive at Vung Vieng Fishing Village, enjoy time around the village with traditional bamboo boat rowed by the local people. 15:30pm – 16.00pm Return to Paradise Explorer heading back to Main boat. 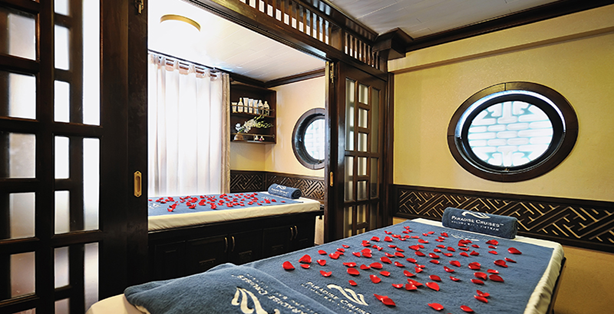 Relax and Enjoy Spa services on board while cruising or sightseeing. 17:00pm – 19:00pm Enjoy “Happy Hour” Buy 1 take 1 on selected beverages. 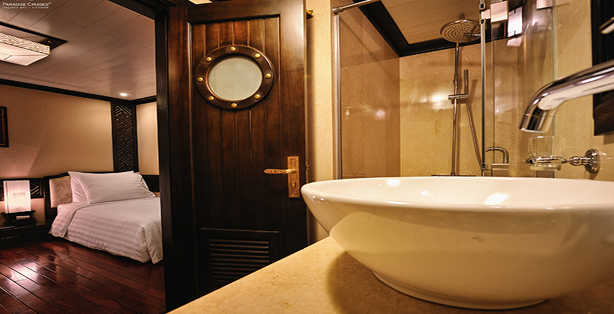 Enjoy spa at your leisure on board. 18.00pm – 18.30pm Enjoy cooking demonstration with Chef to discover another Vietnamese cuisine. 18.30pm – 19.00pm Pre-dinner cocktail on sundeck. 19.30pm – 21.30pm Serve elegant Paradise dinner. 21.00pm – 23.00pm Evening Activities – relax at leisure; enjoy Movie Night, Board Games, and Fishing or Beauty Spa services. 7.30am – 8.30am Relax or Visit Sung Sot Cave – Hiking up and down 600 steps to the magnificent limestone formations of the most beautiful and biggest cave in Halong bay. 9.30am Check-out cabins and settle bills. 10.30am Arrive at Tuan Chau Island.